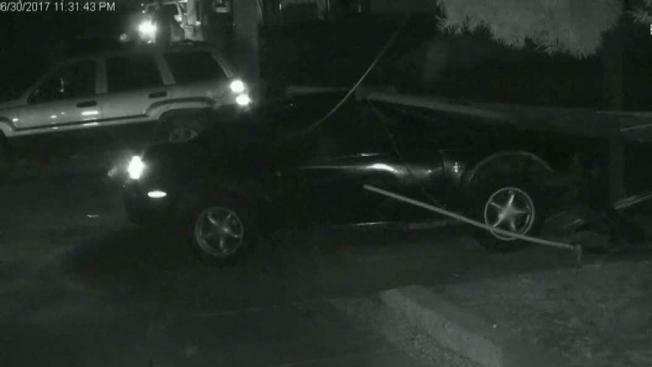 Home surveillance video captured a horrific crash in San Jose, and residents are saying the type of street racing that caused it is a problem in the neighborhood. In the video, a Ford Mustang is seen barreling around the corner then smashing into a power pole, the wires dangling onto the street below. It happened just outside Shaneel Sharma's house, near Willard Avenue and Scott Street in late June, and his security camera captured it all. "It seems like he was trying to drift around the corner and just lost control," Sharma said. "It happens quite often." He and his neighbors say speeding and street racing happen far too frequently, especially at night and on the weekends. They're looking to police to do something about it. "In terms of property damage, we've had quite a few cars damaged on this street," Sharma said. "We've had other signs taken out over the past few months; I've seen it myself." The Mustang's driver appeared unharmed. It's unclear whether he was cited. Neighbors say drivers typically ignore signs warning them not to use Scott as a shortcut. "They come bursting down like 40 miles an hour, which is really bad," neighbor Armando Ledezma said. "There's kids in the park here." Sharma wants more police presence in the area, "making sure people slow down" and hopefully preventing another crash like the one outside his home. "We've had people hit in the streets," he said. "So we need to make sure everybody's safe."